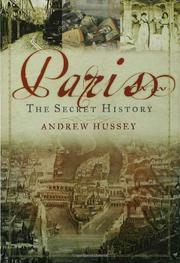 A compelling history of the city on the Seine. Hussey (Comparative Literature/Univ. of London; The Game of War: The Life and Death of Guy Debord, 2001, not reviewed) observes that once humans arrived in Europe, the site on the Seine appears to have been continuously occupied. He discusses the Romans and their predecessors (Julian was the first to call the place “Paris,” for the Parisii—of Celtic origin—who once lived there) and takes us through centuries of ensuing history in entertaining and enlightening fashion. All the familiar names are here: Clovis, Sainte Geneviève, Charlemagne, Abélard and Héloïse, the Charleses and Francises and Henris and Louises (Louis XVI was, says Hussey, “a man without qualities” with a “silly Austrian wife”), Napoleon, de Gaulle. And countless artists, novelists, poets, playwrights, philosophers and prostitutes. Hussey sees the ancient conflict between ideas and desires as key to understanding the city. He guides us through important French poetry, novels, films, music—but also along the rivers of blood running in the streets in just about every century. He examines the long history of North Africans, Jews and other immigrants to the city. He wonders at the foul collaborations of many Parisians with the Nazis. Throughout, he endeavors mightily to focus on ordinary life, but he spends much time recalling the city’s cultural history, as well—e.g., the building of Notre Dame, the arrival of the railway and Metro. An immensely readable, richly detailed and sometimes disturbing chronicle that explores much of the darkness in the City of Lights.